This compilation of a meticulously drafted equation word problems is designed to get students to write and solve a variety of one-step, two-step and multi-step equations that involve integers, fractions, and decimals. These worksheets are best suited for students in grades 6 through 8. Click on the 'Free' icons to sample our work. 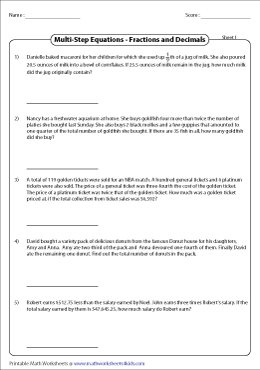 Read and solve this series of word problems that involve one-step equations. Apply basic operations to find the value of unknowns. 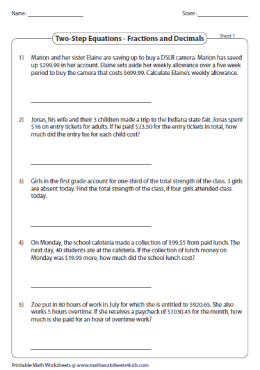 Interpret this set of word problems that require two-step operations to solve the equations. Each worksheet has five word problems. Read each word problem and set up the two-step equation. Solve the equation and find the solution. This selection of worksheets includes both fractions and decimals. 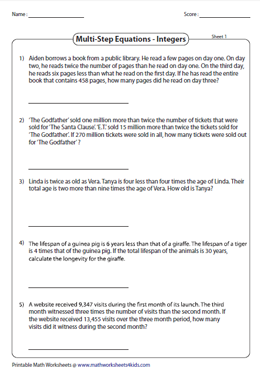 Pick the correct two-step equation that best matches word problems presented here. 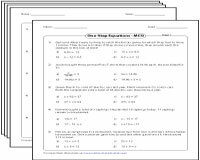 Evaluate the ability of students to solve two-step equations with this array of MCQ worksheets. Read each multi-step word problem and set up the equation. Solve and find the value of the unknown. More than two steps are required to solve the problems. Write multi-step equations that involve both fractions and decimals based on the word problems provided here. Validate your responses with our answer keys.